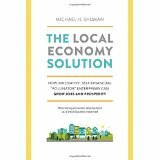 Michael Shuman’s The Small-Mart Revolution, published in 2006, remains the textbook for 21st century localism 101, exploring why buying local first is essential to economic health. Six years later, Local Dollars, Local Sense delved into the opportunities for and barriers to ordinary Americans investing in local businesses. 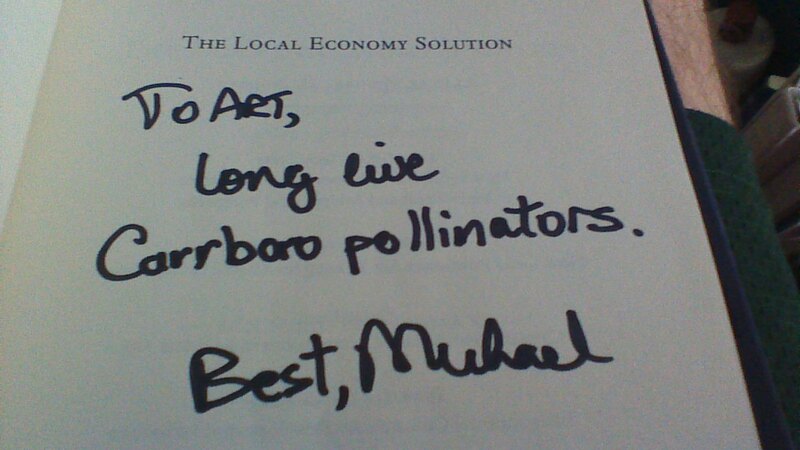 The Local Economy Solution, released in June just in time for the BALLE conference in Phoenix, continues the progression through what Shuman calls pollinators. Thereby combining the theoretical with practical experiences, Shuman builds his case that pollinators, both for-profit and non-profit and usually depending on earned income, can produce sustainable jobs committed to community at little or no cost to taxpayers. He explores chapter by chapter five types of pollinators. Shuman names the pollinators based on the “key economic-development functions” they advance. Planning pollinators, such as Grand Rapids’ Bazzani Associates, advance green design, business efficiency, and placemaking. Purchasing pollinators, of which Edible Communities is just one, create tools that include local versions of coupon books, business publications, web-based marketplaces, debit cards (the current, better functioning incarnation of local script), and loyalty and gift cards. People pollinators, such as Seattle’s Fledge, develop the human factor in local economic development. Their strategies include enterprise facilitators that develop local business people, local economic development training, schools for youth entrepreneurs, short entrepreneurship courses, maker and co-working spaces, incubators, and accelerators. Local First Arizona, host for BALLE 2015, exemplifies a partnership pollinator. This cohort uses joint support, advertising, purchasing, delivery, and selling. Facing the most regulatory challenges, purse pollinators mobilize local capital to finance local businesses through local banking, investment funds, prepurchasing, and securities creation and trading. In moving local economic development into an empowered private sector, Shuman makes another revolutionary statement that he can again support with data from the field. This practical, results oriented methodology produces ideas that can appeal to both left leaning progressives and libertarians. That broad spectrum approach provides the hallmark for contemporary localism, a burgeoning movement shaped in many aspects by Shuman’s work.